Ultimately your own inner guidance will always show you the best way ahead if you know how to listen to your inner guidance that is (which is another outcome as you utilise these resources, they offer the ‘how to be’ in touch with your own wisest empowered intuition). We often assume that we consciously are running the show, but we are in fact very automatic subconscious creatures. We were born perfectly and through conditioning from childhood have developed mostly good but possibly some hindering programmes. These programmes seem to run automatically and on an everyday level your subconscious is just running them as you taught it to with your focus and emotions. However in QHHT we get to speak to a different part of the Subconscious – more like the ‘Superconscious’ / the ‘Higher Self’ that knows the answers, the ‘why’s’, the ‘hows’ and can guide your healing and your journey. These methods are all beneficial when gaining clarity is important to you. Fear and stress are the number one emotions that hinder positive flow and life transition. However fear is an illusion, it’s not real. It’s true that what we focus on effects how we feel. Focus is what we say to ourselves, and speak about, what we believe, imagine, also the stories we tell ourselves. Through focus we can either be living in the past, the future or the present. The subconscious does not know the difference between real or imagined experience. Your focus will impact your emotions, your emotions strongly influence your behaviour – what you do and don’t do, and it’s your behaviour that ultimately impacts your results. So it’s clear that focus is important. By the way do you focus towards your goals or away from what you want by thinking about an endless list of what you don’t want…? Have you ever noticed what you resist – persists? Fears and Phobias are quick to get and equally quick to go fortunately with either a single NLP session or in a single session of Quantum Healing Hypnosis, fears and phobias fade into the past out of your present reality. In ten years I’ve facilitated breakthroughs in these perceived fears time and time again. The subconscious mind is the seat of the emotions, it’s language is imagery. So a perceived fear visualised enough becomes a perceived danger, we go on ‘alert!’. Although fear is not real – it’s imagined. Most people lead their lives based on beliefs, but beliefs are simply beliefs and facts are facts, those that I’ve worked with are delighted at how fast these empowered shifts in experience happen, hence the term ‘life transition’. An elated shift in one area naturally effects other areas of life and relationships. When you feel good, you are an uplifting influence to those closest to you. When you drop the fear it’s like moving into a new paradigm reality where you see things for what they really are, you can breathe deep and smile. Do you know what you’re here for? Yes, I’m asking the big question… Do you feel that you are on track in life in a way that feels empowering and good whilst contributing in a positive way to others? What percentage of your days and week do you spend enjoying the experience of being you, whether that be in doing something or simply being? How much of your day do you drop the mental mind chatter and stop polluting your present moment with worries and concerns? Is there conflict in your life? Do you feel a soul connection to your partner but sense there is room for a deeper connection? Do you sense that you may well be able to discover another way of being that no matter what was said to you it wouldn’t matter because you know yourself and you just keep sending unconditional love? What rituals and practice do you put into developing yourself and how you really want to be, what you would like to achieve? Do you meditate? What hobbies do you have or would like to have, that will add value to your life? What percentage of your focus is based on what you can do v’s what you tell yourself you can’t do? Do you ever weigh up your emotions throughout the day, are you emanating more positive states of being or not? Do you exert more energy over habitual patterns of behaviour or in setting up a very clear image and positive intent in how and where you are heading in your life? Do you wonder about what you seem to attract and manifest in your life? Do you sense that you could well be influencing this? What do you think might happen to your results and ultimately your destiny in terms of projecting a positive mind set of acceptance and gratitude whilst taking action? When you look back at this all (your life) from some distant future point… What advice would you give you now? As a personal growth enthusiast I simply love supporting people in manifesting a life of clarity. When we fully let go of self sabotage behaviours and develop a healthy mindset we are very powerful beings – master manifestors! Personal development is assisted in leaps and bounds in a single 2 hours session of NLP combined with Advanced Hypnotherapy and the 3-4 hour session of Quantum Healing Hypnosis. In your session we can provide the space and energy to enable you to make the changes you really desire. If you are unsure as to what you really want – that too is a fantastic starting point for getting clear as your consciousness expands. The components of success are desire, belief and expectancy… I look forward to supporting you. Good advice sometimes isn’t enough though. It’s not about what we know, but about what we actually do every day. This is how we achieve goals, however the fuel to get us there is of a higher grade when we take time “to do some~ being still every day…” Clear the mind to establish the benefits that come hand in hand with accessing the alpha brain wave levels while resting and taking a break from the constant drone of the inner mind chatter for at least a few minutes morning and night in meditation or self hypnosis. Many pay too much attention to inner dialogue (head stuff going on) that seems to keep spewing forth at speed, almost being controlled by these fast thoughts, working themselves up into anxiety states of being and going too fast to acknowledge the small milestones made along the way. It is good practice to take a step back, become the observer instead of being controlled by your thoughts. You may call taking a few moments to let go, slow down and clear your mind meditation or even contemplation, there are many methods all so good for health and wellbeing. There are additional enjoyable ways that help us further like yoga which is a moving meditation, walking in nature grounds us and clears the mind, swimming in the sea and most importantly breathing deeply from the stomach enables the parasympathetic nervous system do it’s healing and balancing work. Some seem to be fearful of their own thoughts and feelings and try to ignore them and some people try to drown out their inner thoughts by maintaining background noise like TV and Radio, but the Subconscious will never, never be ignored. There is a big difference between the smaller part of the brain the conscious mind chatter where the inner critic dwells, and the larger and far wiser Subconscious (seat of the emotions). When we speak of ‘heart felt intuition’ or our ‘gut instinct’ this is the Subconscious. There are consequences to not listening to the intuitive guidance the Subconscious works at giving you; things can start to go wrong, signals for change are pain signals or even seeming accidents and illness until we find the meaning. Suffice to say it is best to take time to resolve inner conflict or learn more about how to align yourself in your most effective way in your life by acknowledging your higher self that guides you through your instincts. 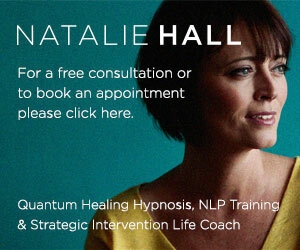 If you would like to learn how and would like some support then please get in touch with Natalie. Balance is key in life; a good mix of doing and being ~ taking positive steps to complete what you know you want to do and taking time to rest in daily meditation, the body needs to move and exercise that you enjoy, dance, music, loving and caring for others feels good including loving our pets. Give yourself a healthy dose of positivity by taking a break from the mental pressures of having and should have done so much, always remembering to enjoy the present moment because that is all there really is. *Take one slow deep breath into your stomach now… Feel your stomach rise then your chest, hold it for a few moments, just stop and clear your mind… Feel the temperature of the air on your face, hands the contact of your feet inside your shoes or on the floor… Now release the breath with a sigh… ~ you have already begun a beneficial practice, do this every hour and notice how calm, centred and clear you feel ~ this is how we get into the flow of alignment of intuition and joy. When a relationship forms, the union of two different energies that have never before existed come together. Vast experience and learning happens in this journey, ways of communication are explored and the results of this communication are experienced and felt, our paths may seem to take a different course. There are many levels of communication. When you feel something and do not express it to your partner, they feel it anyway. When you speak your truth, this gives your partner the opportunity to understand and you can learn your partner’s perspective. Communication happens without words as much as with words. Take interest in your partner and ask questions, be truly inquisitive as opposed to ignoring or accusing (as you do this what is your body language saying as you speak to your partner and what tone do you use?). Separate what you assume are facts and those that might not be and clarify. The most powerful place to begin the journey of awareness in relationships is from within. The ability to recognise and assure that your emotional state and energies produce the experience you desire. If this is not the case, I can show you how to empower yourself to change this. More and more people are waking up to the fact that we are similar to human transmission towers and the focus and energy we create internally is sent out is amplified and returns, this awareness is very empowering. We tend to get what we focus on. It is good practice to notice what you are focussed on so you can realise what you are producing, you can then make a choice whether to do more of the same. If what you are doing is not working – do something else whilst remaining true to yourself. To add richness to your relationships, understanding the psychology of yourself and your partner are key to creating loving dynamics together. Further to this, we know that we have 5 senses; we can see things (visual), hear things (auditory), feel things (kinaesthetic), smell things (olfactory) and taste things (gustatory). Yes? Neuro Linguistic Programming has simply named these senses our Representational Systems, these help us to make sense of the world as our senses code our memories and govern our capabilities and beliefs. We usually use 2 representational systems slightly more than the others, e.g. You could be primarily ‘visual’ (imagine in pictures) and you maybe secondary ‘kinaesthetic’ (you get a feeling about things, may need to touch). What I am leading you to with this is that your understanding of your internal world leads to the realisation that you can change it, as what we hold within becomes our experience and is most definitely felt by those around us. When you can identify which representational systems your partner uses predominantly, you can learn ways to reach them emotionally on a level they feel appreciated and cared for, you can lead the way and they might even want to choose to take more of an interest in you too. How you code these representational system is what we call submodalities, coaching around submodalities is very enlightening. To learn the ability to change the way we feel depends upon our ability to change our submodalities. Interestingly expanding on the representational systems, my studies in Energy Medicine highlight four sensory system stress modes which have interpersonal perils in each of the styles, that once understood can lead to greater understanding and empathy for your partner and yourself, I’ve discovered this to be true. The detail and the real learning is discovered in the experience. This knowledge is empowering for individuals and satisfying for me and I find that I’m facilitating positive change with connection more and more for individuals remaining in and strengthening their relationships, and also those embracing change as they make their transition and move out of a relationship. You cannot change anybody except yourself and you can influence with integrity. The most empowering relationships will start with you. Are you building loving understanding and connections in your relationships? I love the above quote, it’s so true! If you begin to notice how you hold your body, how you’re breathing and what you’re doing with your face when feeling certain emotions.Then test changing your physiology, how you’re standing or sitting, breathing, and also notice how your face feels, whether it is taught or relaxed and anything else about your face that you maybe doing. You will find that you can influence how you experience yourself and explore this. Try smiling and breathing slightly deeper into your stomach, letting your stomach rise with each inhale, stop the internal mind chatter, just clear your mind for a few moments, explore relaxing your shoulders down and hands, notice the temperature of the air on your hands, be aware of the contact of your feet inside your shoes on the floor and any noises you may hear in the distance. Imagine what your energy is like, the stillness or direction of movement of your energy now, and become aware of any changes you now experience in your being. Emotions are linked to remembered events in our sub-conscious that we filter into our memory banks, they become stored stories, events happen and more stories are stored, sometimes images with certain emotions stacked and programmed into neurological pathways, these programmes are not only stored in our minds but throughout our entire body. We have cell memory. The important part to know is that we can build new neurological pathways, we can influence our ongoing emotions. The first step is this AWARENESS, the next step is learning to STOP certain patterns running and the next is CHOICE / CHANGE. And continue to repeat these new choices until they too become automatic, as these new neurological pathways become en-grained habitual ways of being. There is more and this is what I facilitate. What movies are you running? Sometimes we can feel all consumed in our emotions, as we run movies in our minds of what happened in events belonging to the past or could possibly happen in the future… It is well worth stopping regularly and checking in with yourself – become aware of the frequent ‘patterns’ you’re running automatically. Notice where you’re predominant focus is… Is it past oriented? How does that make you feel? What kind of events are you mulling over? Are you always striving for something in the future? Do you acknowledge when you obtain something you’ve been striving for and give yourself a pat on the back, celebrating the small or large milestones you’ve reached? Or do you speed on through creating something else you ‘must do’? Where can you now place your attention to really make a difference to the quality of life you experience? http://www.conscious.tv/psychology.html My TV interview by Alex Howard for Conscious TV offering an insight to my personal journey, the impact of beliefs, family illness, bereavement, and personal and spiritual development. The aim is to offer my example of what worked for me and hopefully offer ideas to anyone looking to create a more fulfilling life. I explain how I learnt to trust my instincts and follow my passion with self belief gained along the way that I can make a difference and in turn this has created a life where I feel I have a purpose. Positive change can happen when following what feels right and taking small steps towards what you would really like to have happen. Training with a view to working with a well established London clinic within the psychology department has been very interesting. The emphasis is an-depth 4 quadrant – integral approach to helping people through M.E., C.F.S. and Fibromyalgia on their journey back to health. As is well known mind effects body and emotions, and also what you put into the body regarding nutrition will also greatly impact the energy available. I am also Training in EFT (Emotional Freedom Technique) as this has proven useful in the programme. It’s a pleasure for me to take on board and understand other Therapists perceptions and experiences. I find it really emotionally rewarding working with and gaining support from other Therapists. Also interacting with their clients and listening to experiences of people that are really rehabilitating themselves through development. Many report feeling empowered by the knowledge and tools gained as they realise this really is about “WORKING THE THERAPY”, the more you put in – the more you get out! The feedback is that the healing journey is one of development both mentally, emotionally and spiritually. I have been rather busy of late as more and more people discover just how useful and far ranging coaching with neuro linguistic programming is. state management, food choice and weight, stopping smoking, ex-heroin addiction, traumas, bereavement, alcohol and sleeping, self esteem, letting go of the need for control, alignment with belief in self, business development, effective communication in team management, developing well formed outcomes and goals and courage to start a new business. I love what I do, and gain great satisfaction seeing the changes people make in their personal development becoming more of who they choose to be.